As new research shows that the number of monarchs hibernating in Mexico reached an all-time low in 2013, conservationists are urging all three countries to agree on a joint plan to keep the annual migration from fading into history. 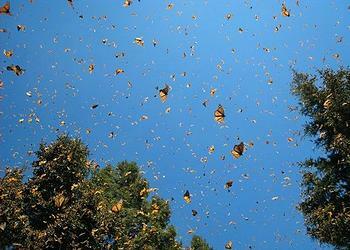 Data collected by the nonprofit WWF-Telcel Alliance and Mexico’s National Commission for Protected Areas, CONANP, show that just 1.65 acres of forest were inhabited by monarchs during December of 2013, a 44 percent drop from the same time the previous year and the lowest area since surveys began in 1993. Factors driving the steep decline originate in all three countries. First, the extent of monarch habitat has shrunk due to deforestation and forest degradation in 11 sanctuaries along the border between the states of Michoacan and the State of Mexico. 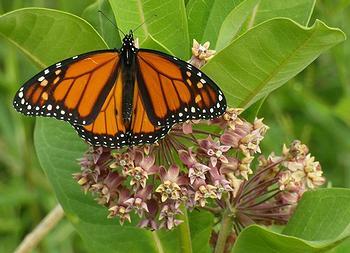 Next, the primary food source for monarch larvae that emerge in the United States and Canada is disappearing. The common milkweed, Asclepias syriaca, is being wiped out by the glyphosate herbicides used on genetically modified crops, the researchers found. Finally, extreme climate conditions in Canada, the United States and Mexico are making the entire life cycle more difficult for monarchs. The World Wildlife Fund is calling on the leaders of all three countries to agree on a plan for immediate action to preserve the monarch migration. The trilateral annual summit between the prime minister of Canada, and the presidents of Mexico and the United States, takes place February 19 in Toluca, Mexico. To carry out the monitoring of monarch numbers, bi-weekly tours were conducted through the 11 sanctuaries that have historically hosted monarch colonies, determining their location, the perimeter they occupied with spatial analysis software, and temperatures. During the second half of December 2013, the monitors registered seven Monarch butterfly colonies – three in Michoacan, four in the State of Mexico – that occupied 0.67 hectares: five colonies (0.62 ha) inside the Monarch Butterfly Biosphere Reserve and two (0.05 ha) outside the reserve. This amounts to a 43.7 percent decrease compared to December 2012 (1.19 ha) and is the smallest area occupied by this butterfly in Mexican sanctuaries since 1993. “Since 2003, in coordination with local communities and the Mexican Government, the Alliance WWF-Telcel supports forest conservation and sustainable development in the region for the benefit of the monarch, the locals, and the tens of thousands of tourists who visit the sanctuaries every year,” said Marcos Linares, Business marketing Deputy Director, Telcel. Most monarchs that arrive in Mexico grew up eating milkweed in the United States and Canada, says Karen Oberhauser, a professor at the University of Minnesota who has studied the monarch for more than 30 years, and is a leading scientist on this butterfly. “Numerous lines of evidence demonstrate that the Corn Belt in the U.S. Midwest is the primary source for monarchs hibernating in Mexico,” said Oberhauser. But an explosion in the use of crops that allow post-emergence treatment with herbicides have killed off the milkweed plants. “These genetically modified crops have resulted in the extermination of milkweed from many agricultural habitats,” said Oberhauser. “In addition to habitat degradation due to use of pesticides and herbicides, recent changes in federal law in Canada have significantly reduced protection of monarch butterfly habitat across Canada,” said Dr. Phil Schappert, Canadian butterfly conservationist and author who lives in Halifax, Nova Scotia, and that has worked and written on monarchs for decades. “The promotion of ‘the economy first’ practices, instead of sustainable land use practices, threatens monarch habitat,” warned Schappert. Mexican authorities have effectively enforced efforts to protect the Monarch Reserve, particularly from 2007 to 2012, say the conservationists. Those efforts, together with the decade-long financial support from Mexican and international philanthropists and businesses to create sustainable projects that create local jobs, has resulted in the decrease of large-scale logging in the core zone of the reserve.